It was a gorgeous morning to meet Rachel and Bryan for their engagement session in some classic Boston locations. 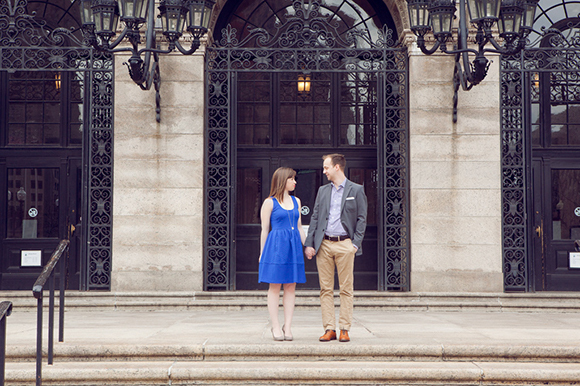 Rachel and Bryan are both architects who appreciate the beauty of the Boston Public Library, so we started there and it is a location I had always wanted to sneak into for an engagement session. Let's just say, it was nothing short of great for photos. From there we went to the gardens and Beacon Hill. With all these locations being popular for the newly engaged in Boston, I am always looking for new streets to explore to put an individual twist on my couples session. For Rachel and Bryan who are easy going and wonderful to work with, I had such a great morning wandering the quiet streets in Beacon Hill. This lovely urban engagement session is going to be a great compliment to their more rural, rustic, camp style wedding in Rhode Island that I cannot wait for in Novemeber.